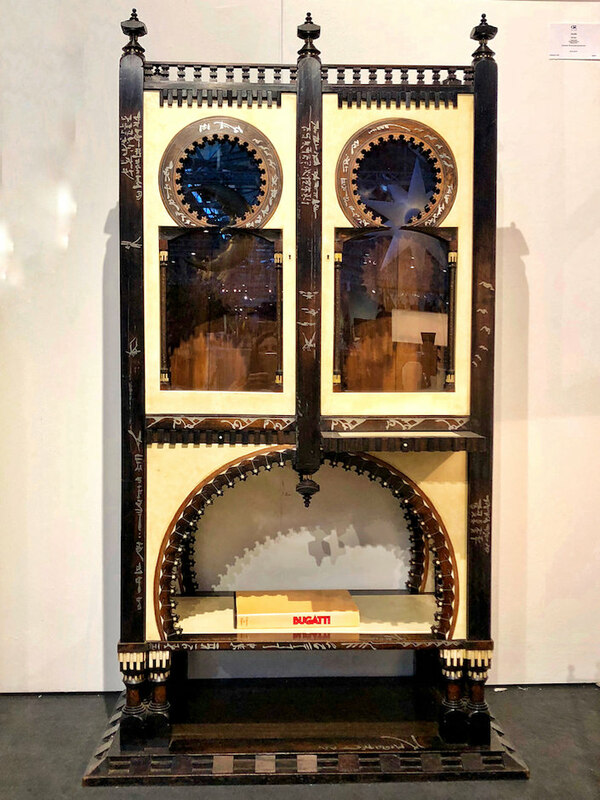 This week I was honored to speak at the San Francisco Fall Art and Antiques Show on a panel about collecting with designers Suzanne Kasler and Jay Jeffers. A big thank you to show chair Suzanne Tucker who invited me and helped organize a glamorous opening night gala as well as many marvelous talks and events during the week. One of the signature elements of the show is the display of designer vignettes created with and sponsored by de Gournay. 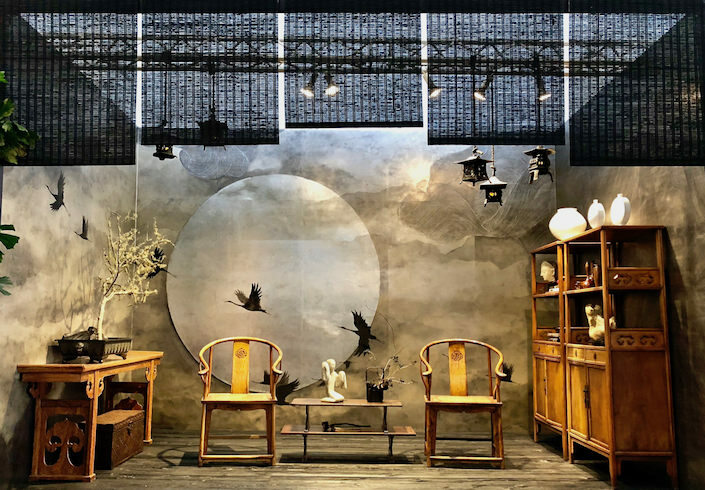 Following this year’s theme of The Sun, the Moon & the Stars: Celestial Imagery in Art, Antiques & Design, the designers incorporated pieces from this year’s exhibitors and worked with de Gournay to show both what they do and what they are capable of creating for their spaces. 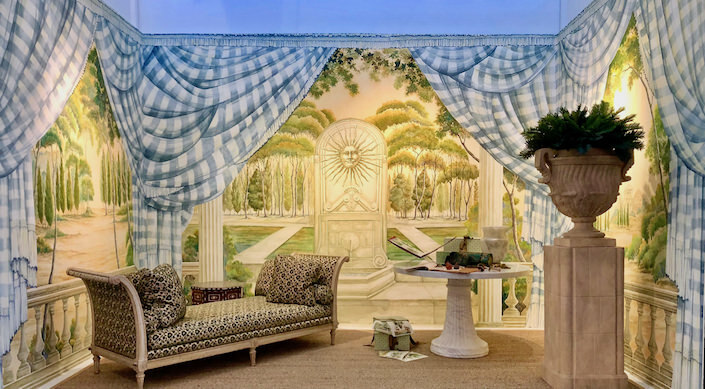 Above, Charlotte Moss‘ Sun vignette was inspired by the drawings of Italian set designer, decorator and painter Antonio Basoli, who helped set the stage for a languorous nap overlooking the Italian landscape. Madeline Stuart, for her Moon vignette, was inspired by Japanese artist Matazo Kayama and a poem by Hanoko Ishii “Tell me the story.. about how the sun loved the moon so much… that she died every night… just to let him breathe.” Her moody, mysterious and romantic scene featured a custom antiqued silver leaf de Gournay paper. 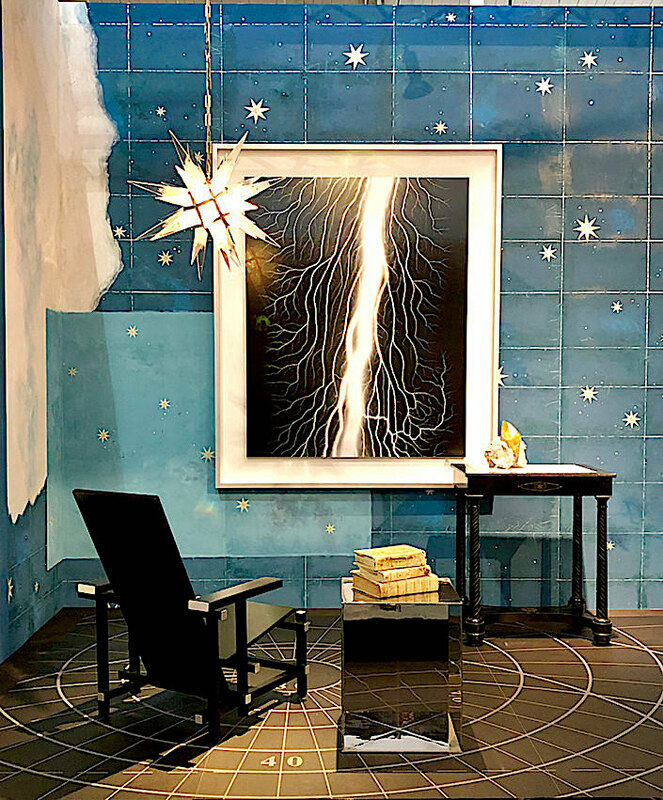 For their Stars vignette, the Wiseman Group drew inspiration from artist Joseph Cornell, who often incorporated stars, astronomy and celestial imagery in his work. They created a bespoke wall covering with de Gournay featuring hand painted and gilded rice paper, sanded and torn back to emulate his work. Local graphic artist Therese Moon was enlisted to design an astrolabe inspired floor pattern, executed by Stancil Studios. 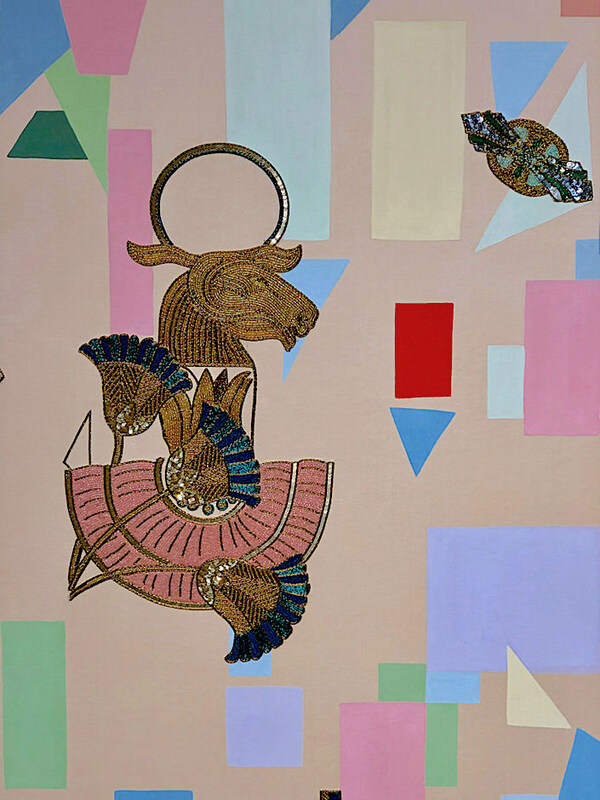 Ken Fulk, with his signature fantastical style, created his vignette around a fictional tale, or as he put it, an “almost believable history” of the Zodiac Bar, “a dazzling hideaway (in the lower level of his Russian Hill townhouse) where guests often trickled in after midnight and departed at dawn.” Working closely with de Gournay, his custom silk wallcovering included detailed hand embroidery and beading, below. The oldest continuously operating international art and antiques show on the West Coast, the San Francisco Fall Art and Antiques Show is the the major fundraiser for Enterprise for Youth, the worthy non profit organization that provides training and job opportunities for many of San Francisco’s youth to help them transition from high school into college and the world of work beyond. 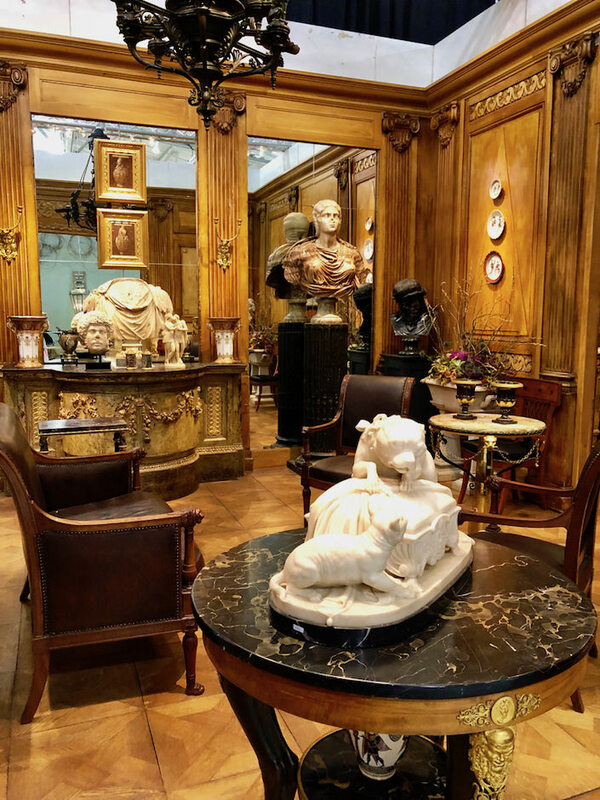 The group of approximately 60 dealers are top North American and European dealers, fully vetted, who bring a wide variety of antiques and decorative art of all periods and style. 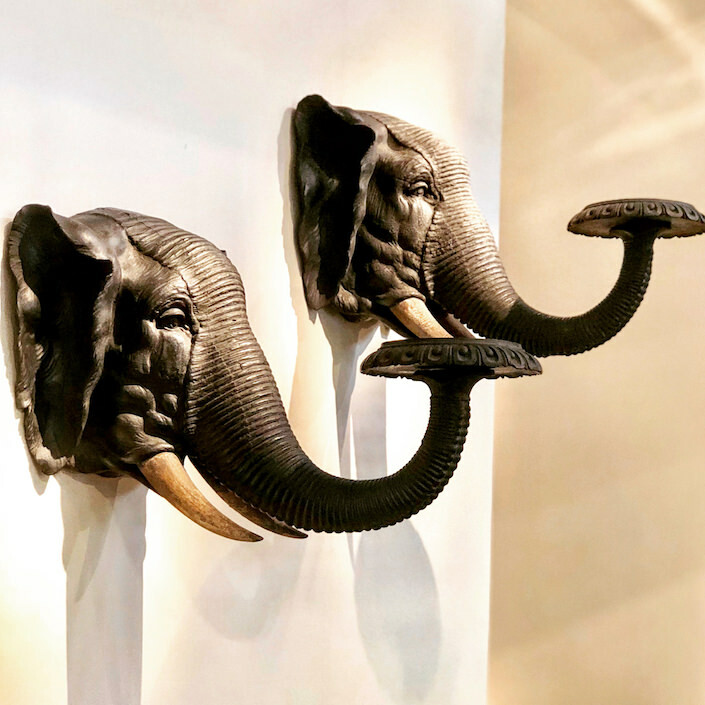 A few of my many favorites included an enormous pair of painted wooden elephant’s head wall brackets, above, from Carlton Hobbs. 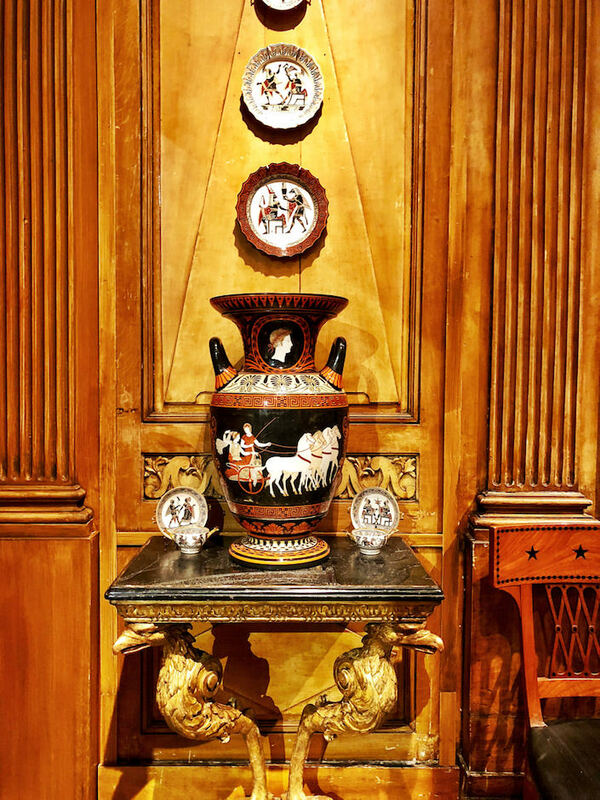 They are not only remarkable in scale, detail and subject but date back to 1680-1720. They also presented an amazing Indian 19th c. giltwood mirror, below. 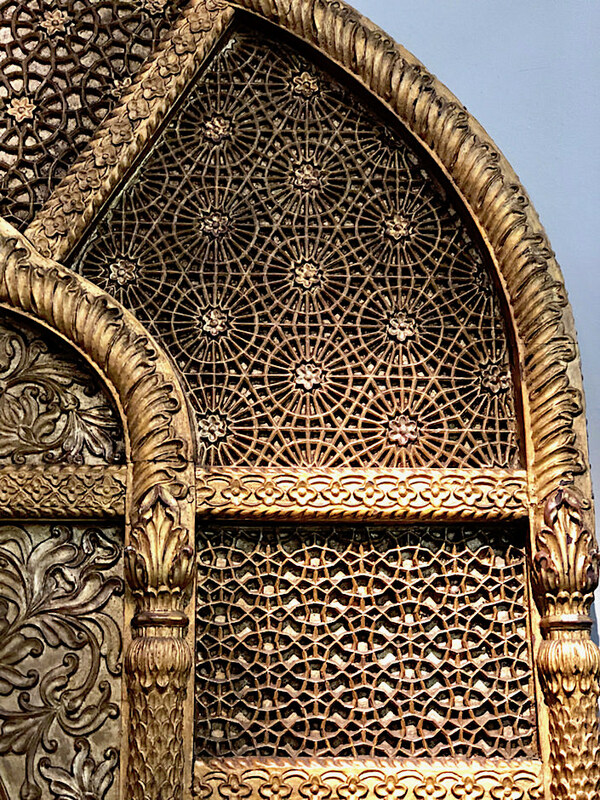 The amazing detailing is Mughal inspired carved geometric tracery. 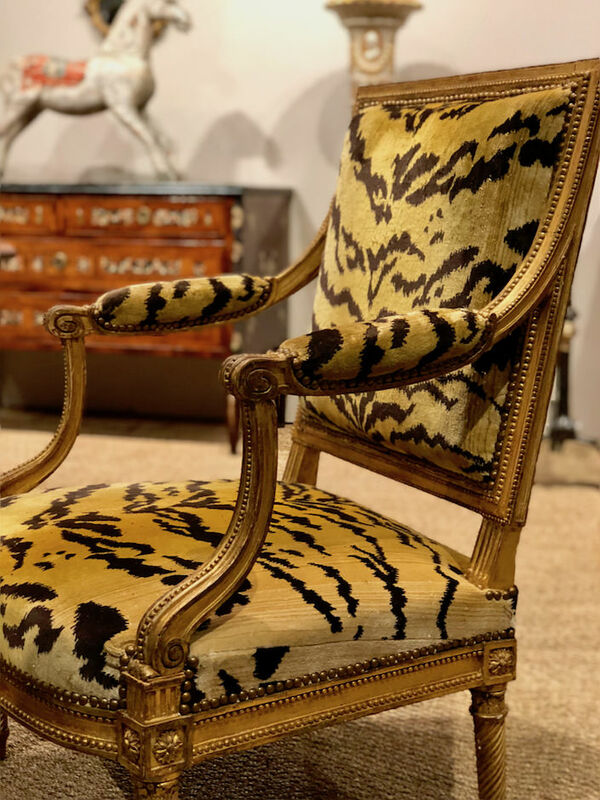 Yew Tree House Antiques showed a pair of splendid 18th century Louis XVI giltwood chairs by Henri Jacob. Some lucky buyer scored them as they were gone by the time I left on Saturday afternoon. 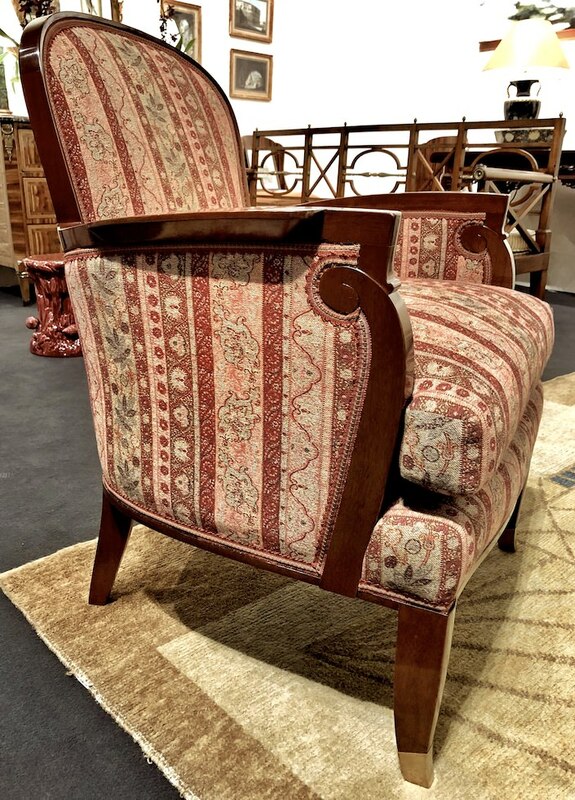 Another chair I admired was this French Deco armchair by the highly collectible Jules Leleu in James Sansum‘s booth. 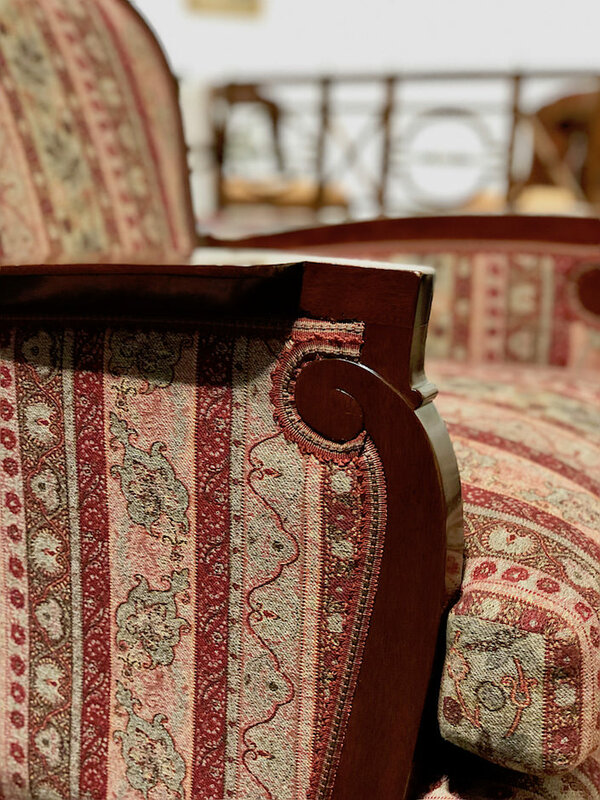 With its distinctive arm, it is evocative of one of the very stylish French Deco period and sensitively upholstered with understated elegance by partner Markham Roberts. 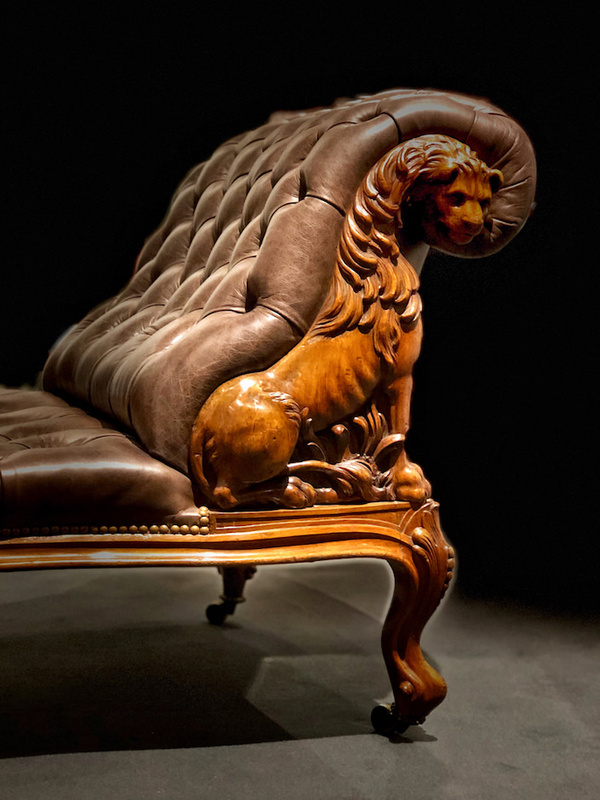 NY dealer Clinton Howell showed this decorative walnut 19th c. daybed in the style most often described as Scottish baronial with its unusual carved lion. 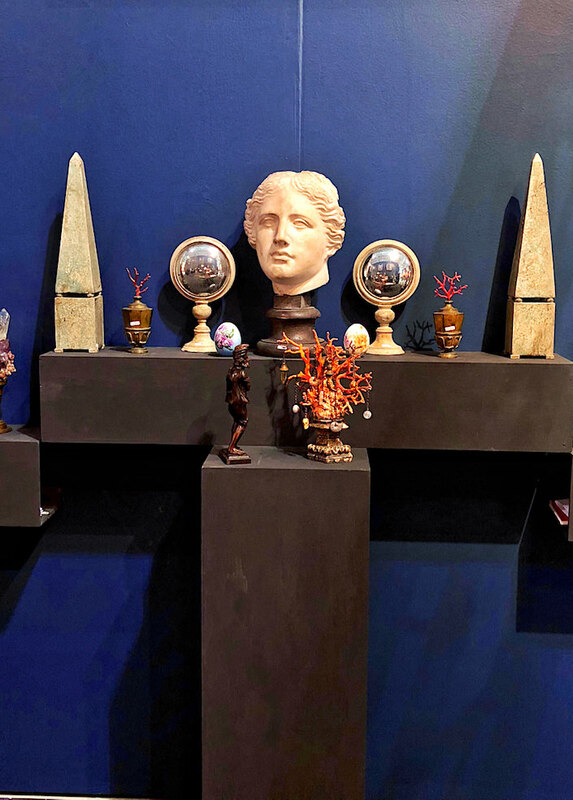 Galerie Steinitz from Paris created an impressive installation including a wide variety of exceptional decorative arts. 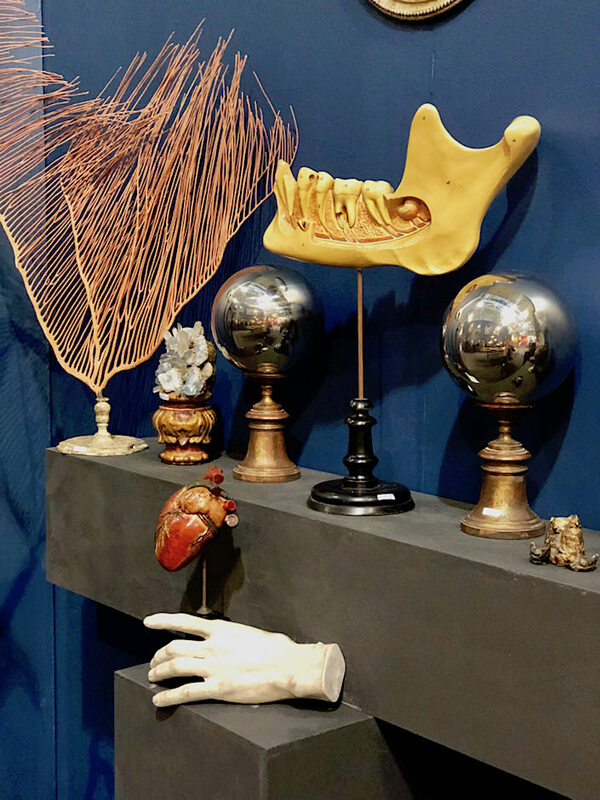 I love being introduced to new dealers and Il Segno del Tempo from Milan showed an intriguing cabinet of curiosities. 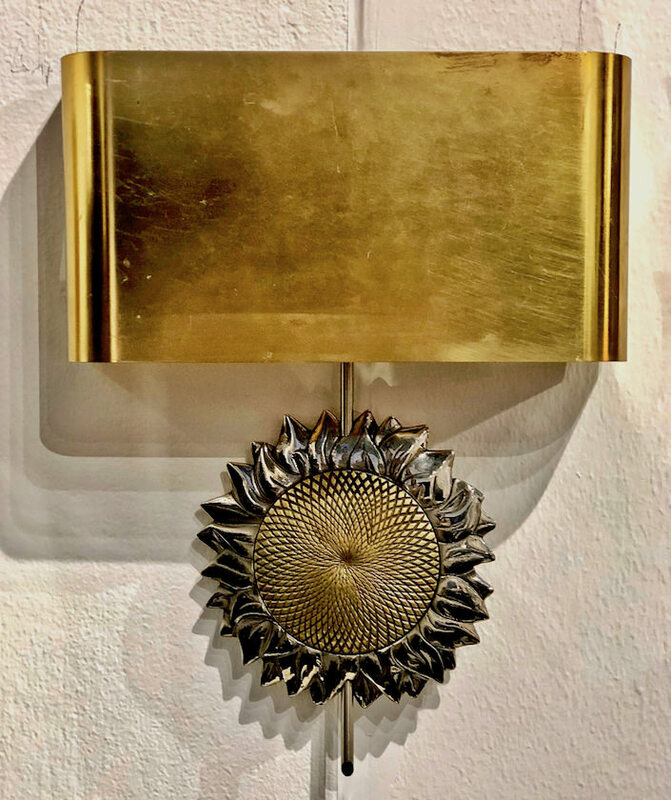 and a pair of glamorous mid-century sunflower sconces by Maison Charles – like jewelry for any room. There was of course some major bling at the show. 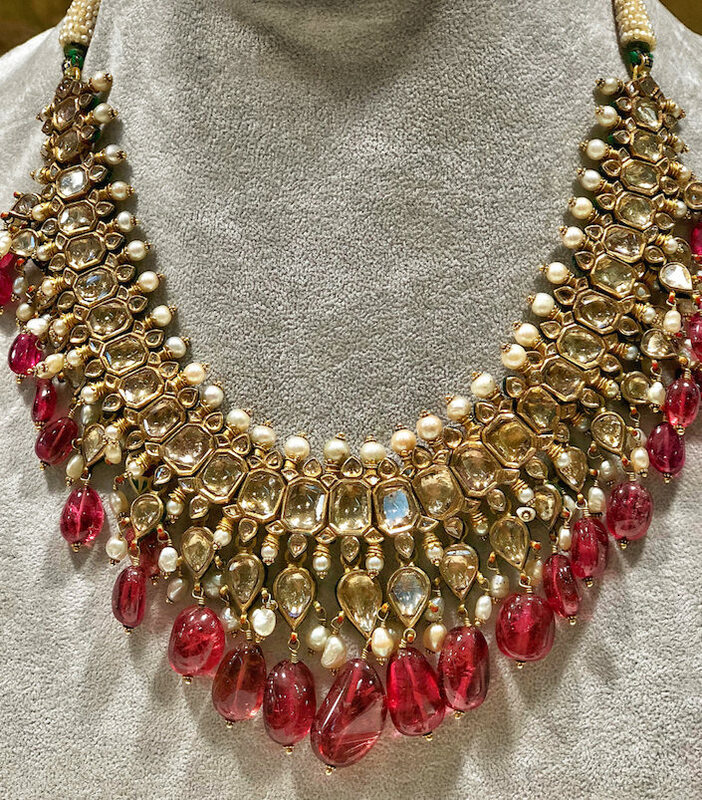 One of my favorites was this diamond and spinel 19th century Jaipur necklace from Sue Ollemans Oriental Works of Art. 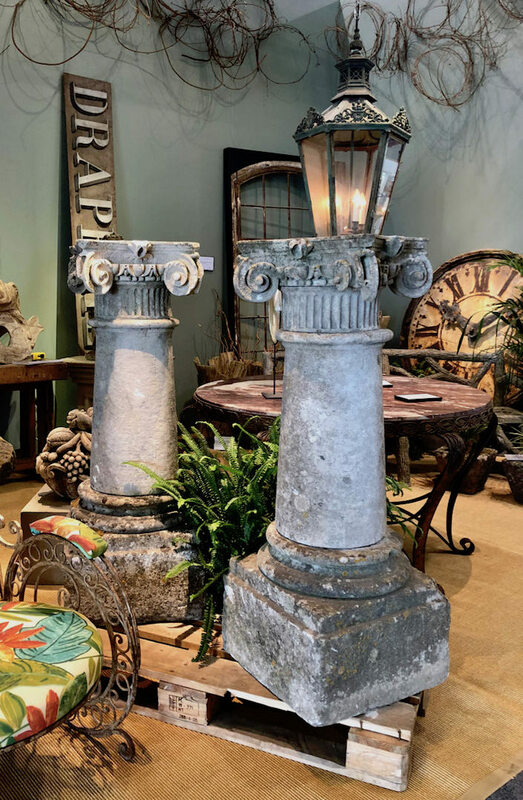 For garden related items, Finnegan Gallery from Chicago showed a fabulous pair of large (4 feet tall) late 19th century British hand carved stone columns from an estate outside of Bath. 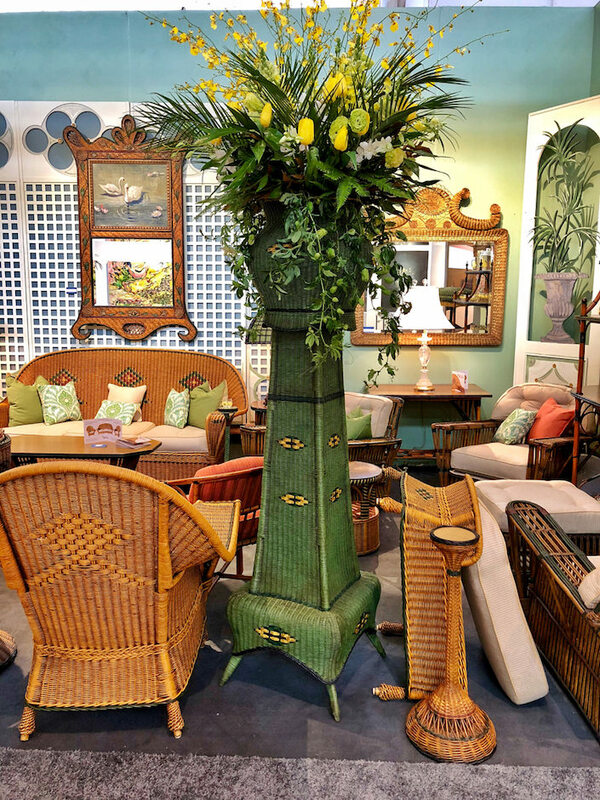 And Antique American Wicker presented a pair of monumental planters that would be statement makers for any garden room that could accommodate their stature. This entry posted in art, furniture, interior design, travel. 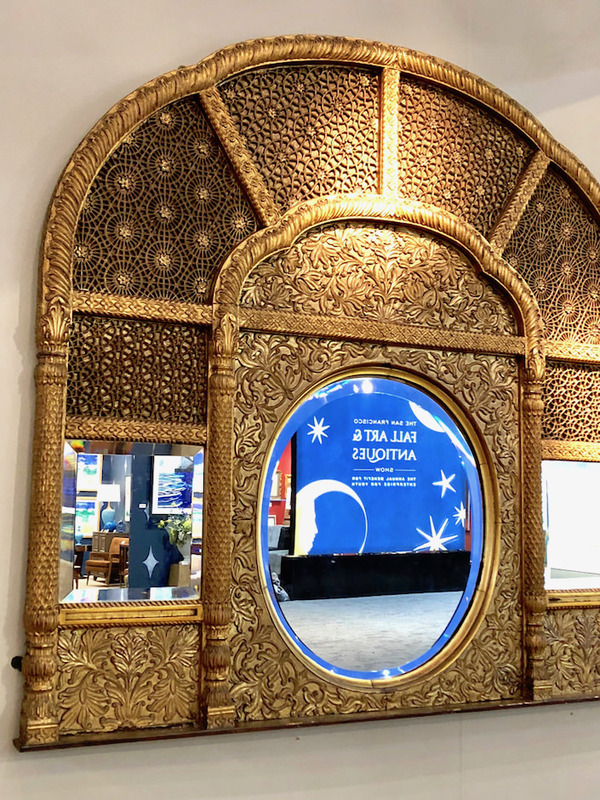 Entry Tags: antique shows, antiques, Furniture, Jewelry, San Francisco, San Francisco Fall Art and Antiques Show Bookmark the permalink. MY FAVORITE THING TO DO IS THIS SHOW in San Francisco!I always look forward to the SPEAKERS and LECTURES AS WeLL.TOP NOTCH Designers and BOOK AUTHORS give their talk and dazzle the audience with a slide show and humor!This year I attended the opening Night Party with My youngest SUN(SON) Nicholas who I thought it was time to show him THE GOOD STUFF so when it comes time to empty MY CASA he doesNOT send it ALL to the GOODWILL!Never to early to Start Educating these Young Things!I think he rather enjoyed it especially when he stumbled upon IL SEGNO DEL TEMPO and understood them as they were in a discussion over a price in Italian!I think That was a AHA moment for Him as He spent his childhood in Italy and his Father still only speaks Italian to him but he understood the conversation!SO, HE TOLD THEM THAT IN ITALIAN!!! I LOVE every last one !……LOVE the STYLE ! What a fantastic show! And congrats on speaking! Absolutely love Ken Fulk’s Zodiac Bar and custom silk embroidered walls!! YUM!! 81 queries in 0.660 seconds.